A highly versatile automotive lineup is a great thing for customers because it means they have many different models to choose from when picking out their new Ford car, truck or SUV here at Akins Ford near Atlanta, GA. High versatility means there’s definitely going to be a model that perfectly meets your needs and suits your lifestyle. But it also means you may have to research model after model after model before you actually find the one that’s perfect for you – which is exactly why we’re here. See, we’re proud to offer highly versatile new Ford lineups here at Akins Ford – one of which is the new 2019 Ford Fusion lineup. With its wide array of engine and powertrain options – including electric and hybrid powertrain options – it can be hard to know which 2019 Fusion is right for you. That’s why we’ve put together this 2019 Ford Fusion vs 2019 Ford Fusion Hybrid head-to-head model comparison. 175 HP & 175 lb-ft. Standard Power Ratings 188 HP & 129 lb-ft. When you take a look at our comparison table above, you may be shocked to see that the 2019 Ford Fusion Hybrid features more standard horsepower than the base 2019 Fusion model, but that’s only because you probably didn’t realize just how impressive the hybrid powertrain of the 2019 Fusion Hybrid is. It should be noted, however, that the standard engine of the base 2019 Fusion model is only one of the many engines available for the lineup, and each of the other available engines is quite a bit more powerful than the two listed in our table. So, if you’re looking for the most power possible, then you’re going to want to choose a 2019 Fusion model like the 2019 Ford Fusion V6 Sport. The same holds true if you need the most cargo space possible. While all 2019 Fusion models feature the same amount of passenger space, the non-hybrid 2019 Fusion models feature more trunk space than their hybrid counterparts. But if you’re looking to save the most money possible at the pump, then you’re going to want to purchase a new 2019 Ford Fusion Hybrid – as you probably already guessed. 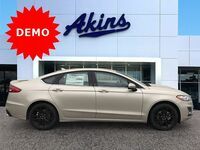 If you’d like to learn more about all the models that make up the 2019 Ford Fusion lineup, please contact our staff here at Akins Ford near Atlanta, GA. Interested in a Ford Fusion?